Wow! Finally! Breakthrough! After 4 battles lost in the row I managed to achieve victory against Wood Elves. I’ve adjusted my army a little (in other words: I get rid of the traitors in my Skaven horde:) and, look at that, I won! To be honest – I’m happy, but first of all I feel relief. The pressure was growing with every next lost game – and now, I think it’s going to be much easier. About few months ago Grey Seer Quicksqueek, great Emissary of Lords of Decay was sent to take Old Dwarf Stronghold in the feet of World Edge Mountains. The Battle was harsh. Stronghold was defended by Greenskins and not only Skaven were interested in looting the treasure chamber inside. From the west – Dwarf Warriors of Thane Glurin Hammerhand were also started besieging the fortress. Poor, betrayed Lord Quicksqueek was forced to give up the siege and run away. Council of Thirteen were not happy with this turn of events. Quicksqueek was given the second chance – acquire the old artefact form the Eastern part of man-thing Empire. Unfortunately other Skaven Warlord was after this magic item as well. Quicksqueek fell under the joined forces of Clan Meekael and Clan Pestilens. He was fleeing with the tail between his legs once again. Lord Quicksqueek flees the battle. Clan Pestilens is taking over! Quicksqueek had no intention to get back to Skavenblight without and gift for The Council – something they would appreciate and fogive him his losses. He decided to hunt for some new Slaves – he marched on the other side of Black Mountains and look for some Goblin warbands. They are always the easy target – and Goblins are good reliable slaves and of course perfect gift for The Council. 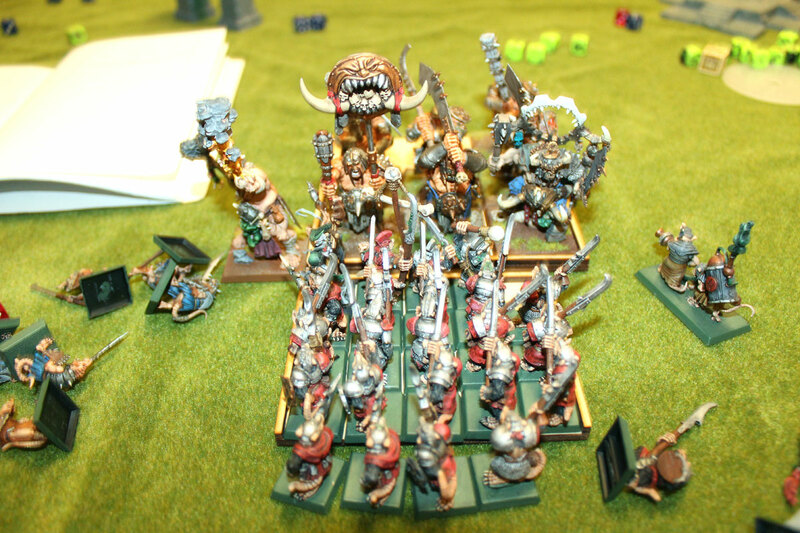 On the way to Border princes – Lord Quicksqueek’s army was surprised by Ogre Warband. Surprised and defeated…again… That was enough – Quicksqueek’s personal savings of warpstone were almost out. He had very little tokens left to hire new warriors. Clanrats weren’t cheap and Stormvermin…wow, those were quite expensive. Something has to be done about it. One more battle lost. Skaven vs Ogres. 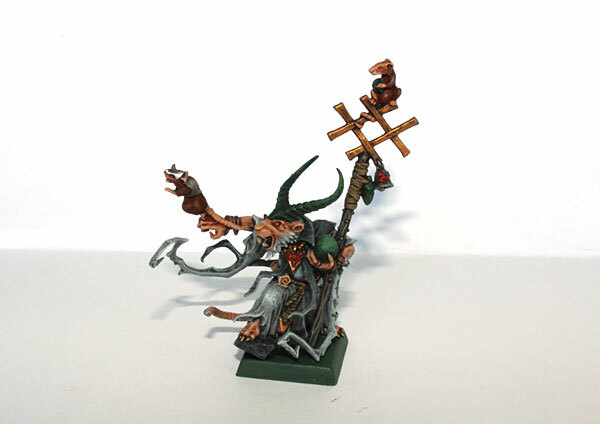 Bad luck and treachery go hand in hand – this old Skaven saying was completely true. Lord Quicksqueek lost the battle again. The scouts spotted Goblin warband – potential easy victory, and… look at that, Clan Eshin’s finest – Gutter Runners – failed to deliver accurate news. Goblins happened to be Orcs and… Trolls! Against Trolls – even Stormvermin have no chance. Orc Warboss Gurokk Skullstompa almost annihilated all of Skaven. Lord Quiksqueek was on his knees (again…). His path to glory and wealth transformed into road of despair and misery. Now, it was his last chance to get back on his feet. Simple as that. Lord Quicksqueek’s personal warpstone stash was almost empty. At the moment he was in need for tokens. In the old settlement of Putrid Stump, he hired fresh regiments of Clanrats and Stormvermin. He also was forced to promise personal favour in the future (oh, he hated to do personal favours) to the mine master in exchange for next group of Slaves to die in the battles. Skaven Attackers. From the bottom: Clanrats, Stormvermin, Slaves, Doomwheels and Grey Seer, Battle Standard Bearer and Assassin. and 2 regiments of 10 Glade Guards equipped with Starfire Arrows. Wood Elves Defenders. From the top: 10 Glade Guards ( led by Captain Antaroth and Spellsinger Kael’thas), 10 Glade Guards (led by Lady Alustriel), Dryads, Treeman. 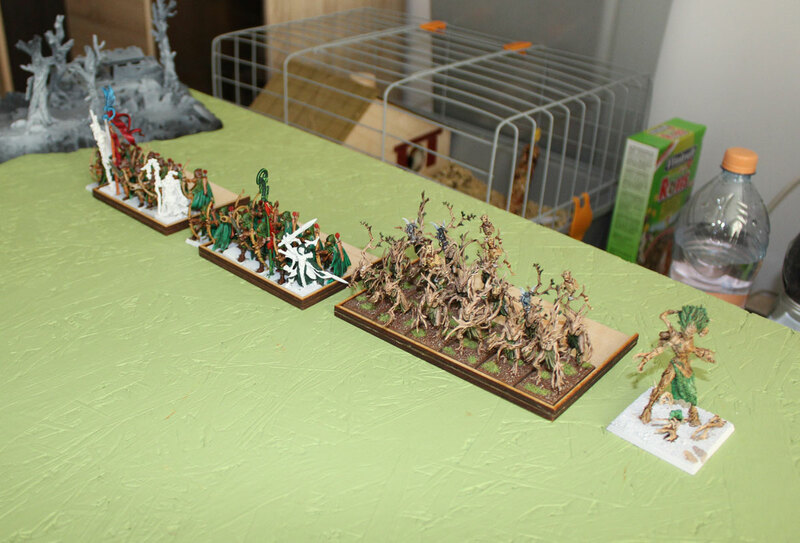 (as you can see few models of Wood Elves army are unpainted. Majority though are top quality. 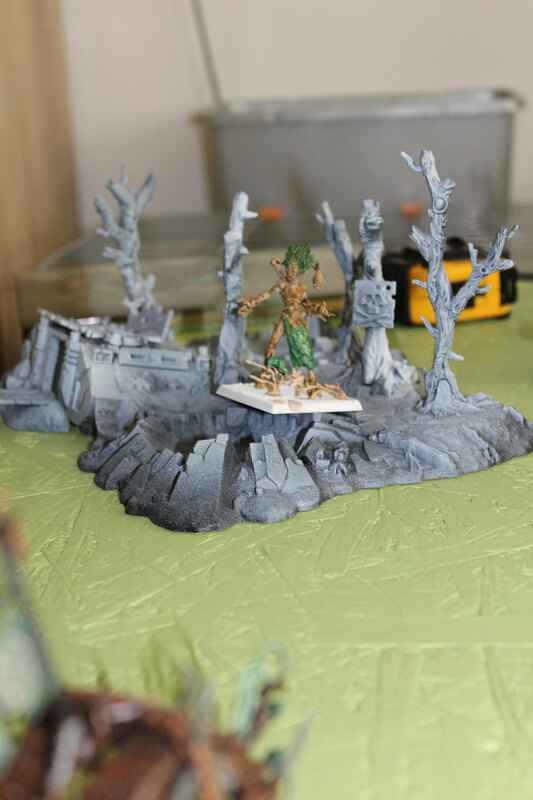 Dryads were looking great, and I can only imagine how these small Elven force would look magnificent if it was fully finished…Next time Jasiek, hopefully!). Skaven army was attacking from the south. Grey Seer Quicksqueek and Battle Standard Bearer Raddish The Last joined unit of Clanrats. Assassin Shide the Silent hid himself in the Stormvermin regiment. On the north, near to the forest line – Elves stood against invader trying to defend their homeland. Wood Elves Defenders. Lady Alustriel joined first unit of Glade Guard Archers, and Captain Antaroth and Spellsinger Kael’thas joined the second. The deployment. Skaven on the left (southern side) and Elves on the right ( forest line). We played standard scenario – 6 turns. The side with more victory points at the end of 6th turn wins. Every beginning of every battle of Lord Quicksqueek looks like this. 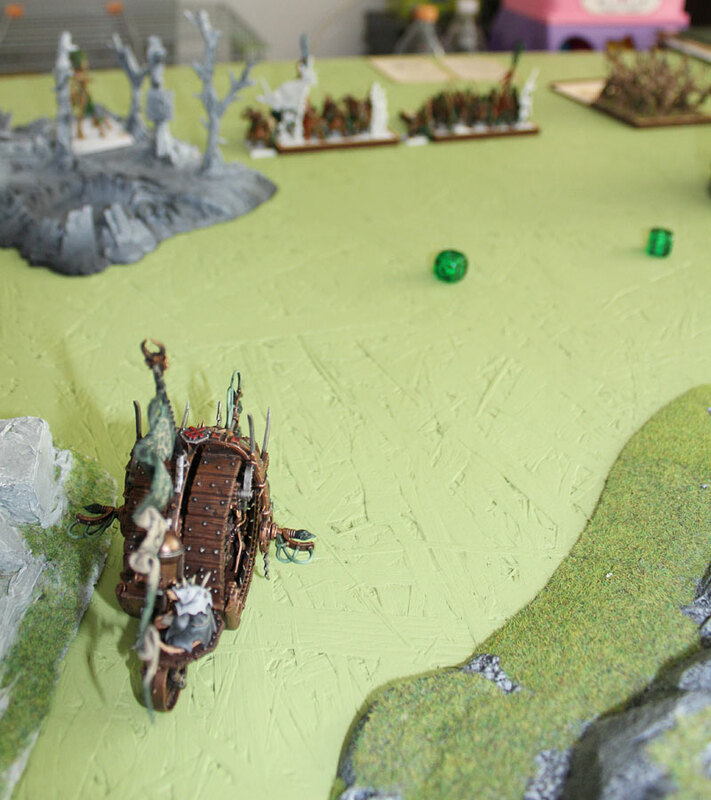 At the very start – Doomwheels rolling towards enemy. And right after the machines rest of the regiments follows. This battle was no exception. Both Doomwheels moved forward. This, on the eastern side rolled fast at the regiment of Dryads and this western one moved close to Treemen hidden in the forest. …and western one into Treeman. Coming to get you, elf-things! 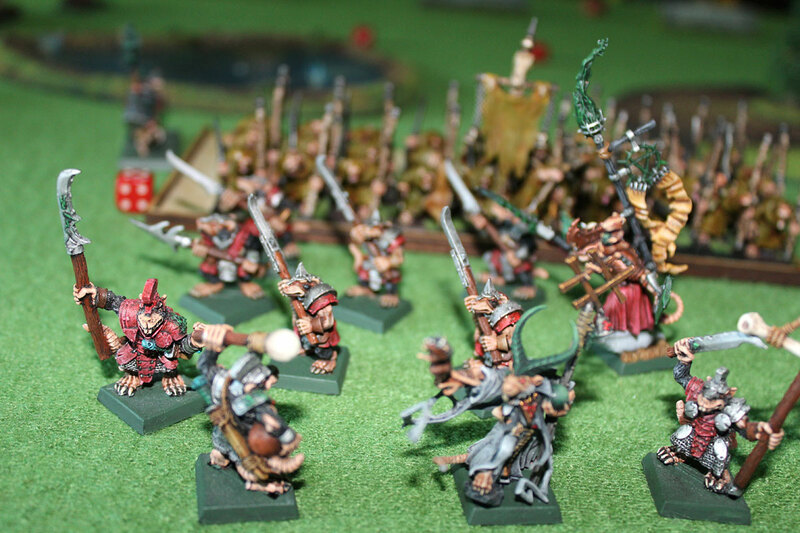 Meanwhile, rest of Skaven army advanced. 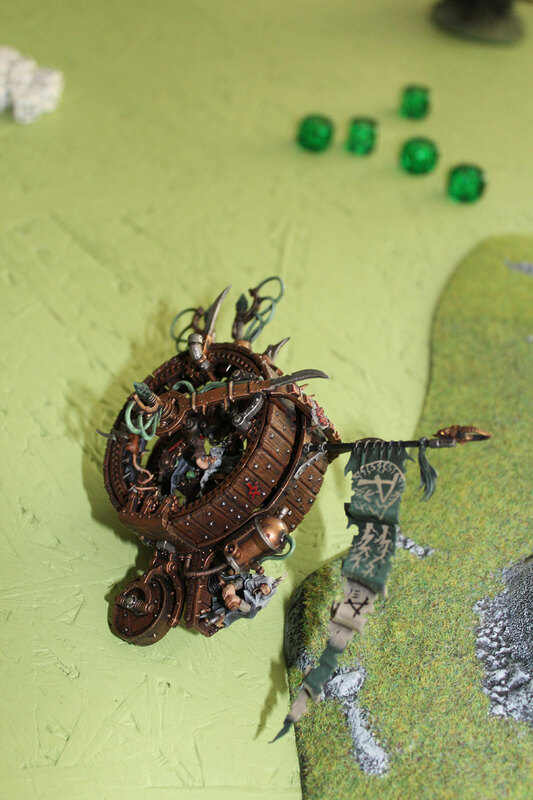 Lightings from both Doomwheels struck the Skaven. Skaven bodies were so close and they attracted released charges, and ZZZZAP!!! – 2 Slaves and 3 Clanrats got fried. Just like that! When Lady Alustriel looked at Doomwheels, she shed a tear. So many magnificent trees needed to be chopped down to built these horrifying machines. So much wood wasted… This deed will not go unpunished! She ordered The Dryads to charge Doomwheel at eastern flank. At the same time Glade Guards released the volley of arrows at western Doomwheel. Also Treemen shot the roots form her ancient body. All the fire were concentrated at the warmachine on western flank. Treeman releasing his Strangleroots at Doomwheel. …and all joined effort were futile. Treeman’s roots did no harm. Lady Alustriel released her magical Hail of Doom Arrow and managed to just barely damage the machine. Both regiments of Glade Guards shot the massive salvo at Doomwheel. Few arrows hit some crucial parts of warp generator. Something buzzed, something zzaped, but still Doomwheeel was not slowing down. 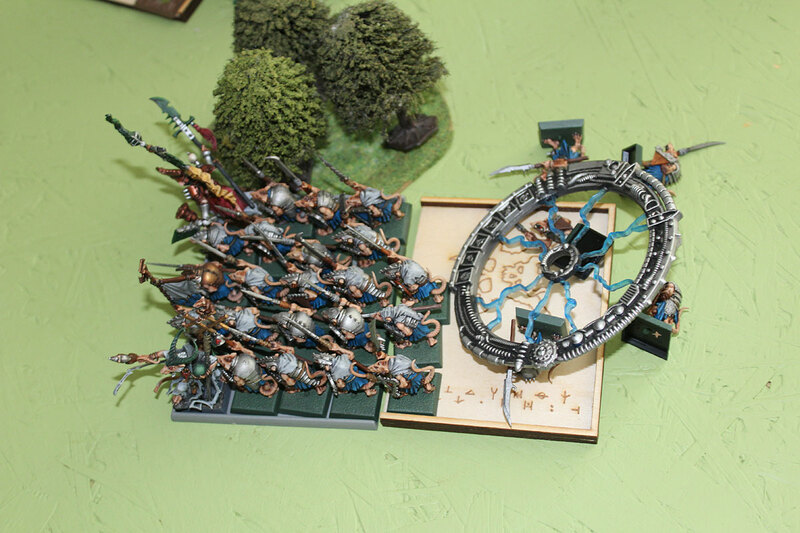 Meanwhile on the eastern flank, Dryads were trying to break Doomwheel. Instead of this, Doomwheel were slowly grinding these forest spirits. 3 Dryads fell dead. No damage to Doomwheel. Despite the loss Dryads stood their ground. That was little bit miscalculated attack… Lady Alustriel sighed… and thought about lost souls of the forest. All! Advance! – shouted Quicksqueek. Clanrats and Grey Seer Quicksqueek are staying in safer place. The Winds of Magic were disappointment. Quicksqueek dragged so little power…All he managed to do is to invoke the spell of Scorch, but Spellsinger was no in position of taking any risk. Scorch could damage the sacred trees around. He simply opened Dispel Scroll and break the spell. The time was right! Treemen had enough of the vermin!. 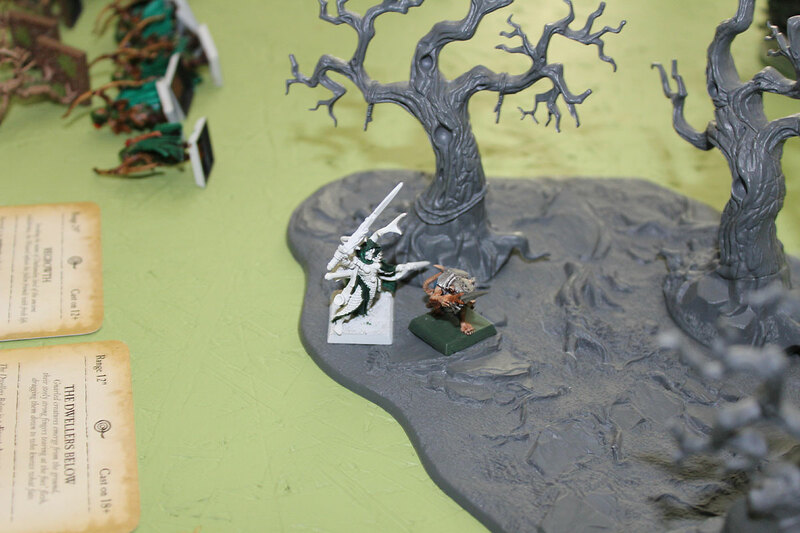 He charged at Skaven Slaves, but these little cowardly traitors squeaked and fled the enormous walking tree. Spellsinger Kael’thas casted Regrowth spell on Dryads – and 2 of them resurrected. No flee-flee! Stay! Stormvermin fight-fight! For the glory of Underempire! Grey Seer’s presence contained the low morale, and Stormvermin were ready to fight again. On eastern flank – Dryads were slowly dying… The wheel ground 3 Dryads and two more were killed by the rats. 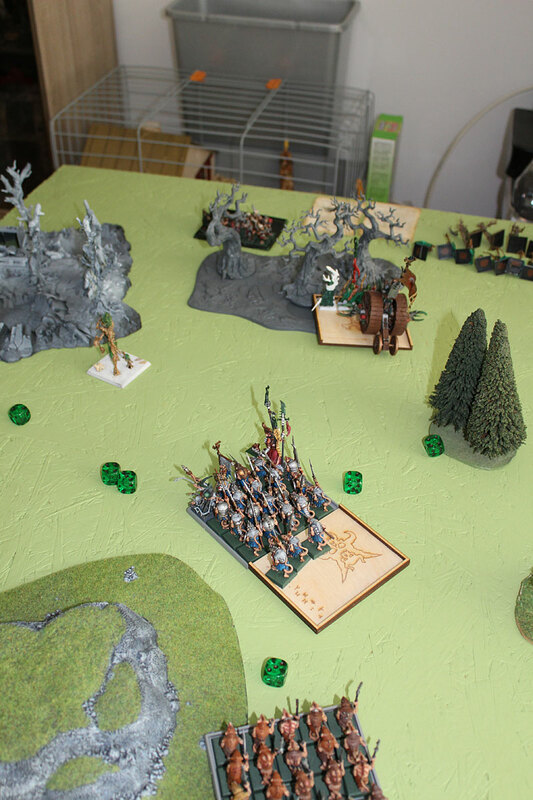 The combat was one sided, but Dryads were held their ground. Lord Quicksqueek shouted at panicked slaves. If you run, I’ll find you all and make sure, your fate will be much worse than all of this! Fight-fight, you cowards! The words of Grey Seer rang in heads of the slaves with echo. 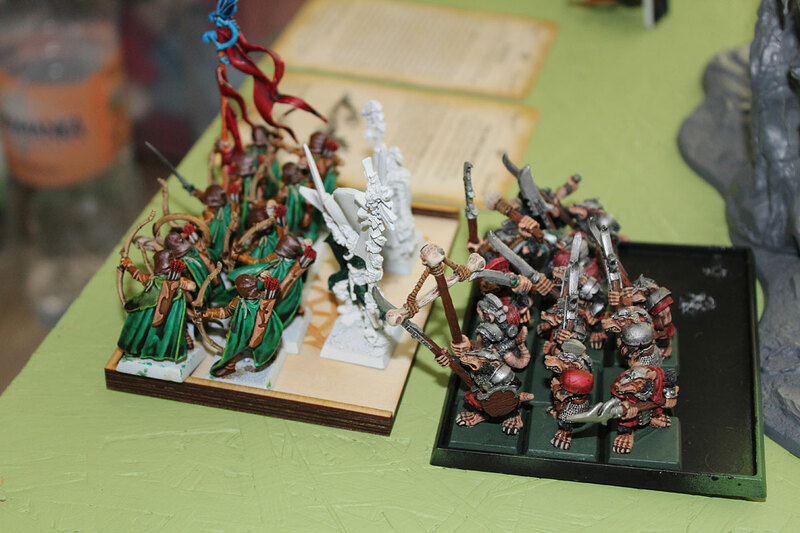 Motivated, but scared Skaven Slaves rallied and prepared themselves for more fight action. There was no other option. Here, we’re going to meet our doom – they thought probably. Meanwhile, Stormvermin charged with fury at regiment of Glade Guards led by Captain Antaroth. 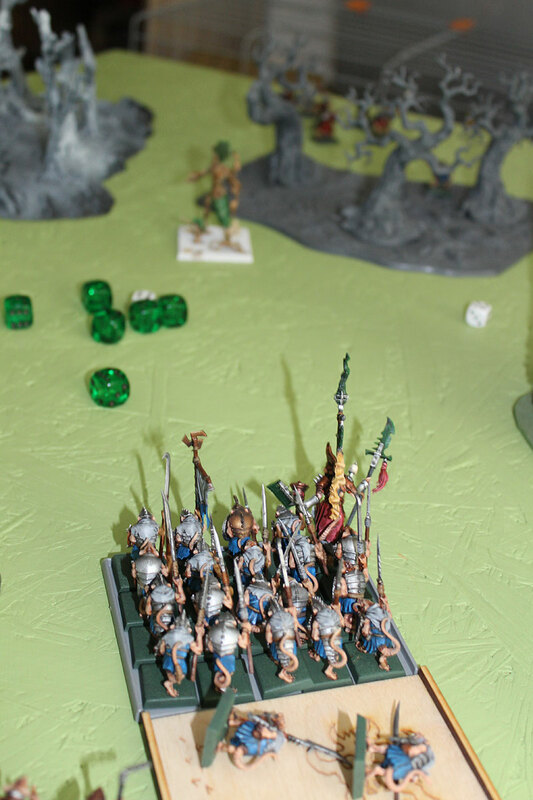 Elves stood and shot – but despite their superior ballistic skills – only one Skaven fell down. Most of Stormvermin got into combat with the battle cry. …and his magic! He pulled the power from the air and invoke the words of Scorch spell once again. The words he spoke had irresistible power. 7 of Glade Guards form Lady Alustriel unit were burned to the ground. Finally success of superior Skaven Grey Seer magic! On the east – Doomwhheel malfunctioned during charging power generator and no lightnings were released… but the wheel slowly was grinding The Dryads. One more were smashed to the ground by this destructive machine. 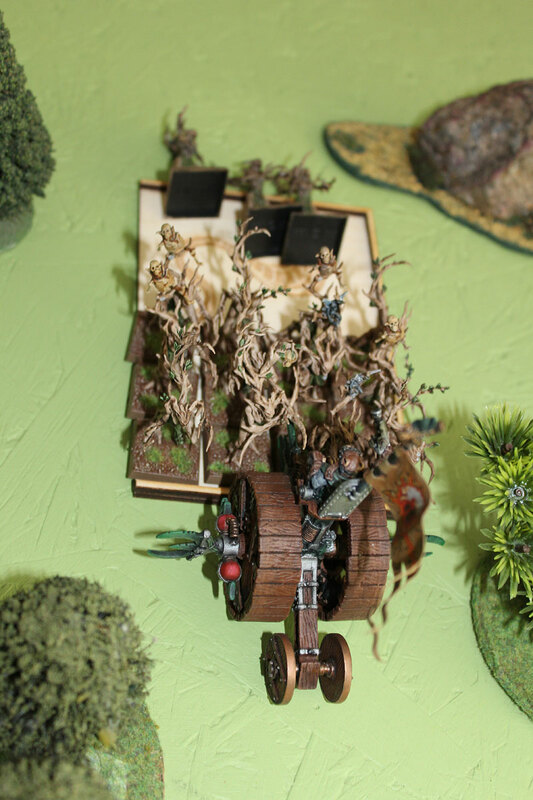 Dryads were courageous tough – they were remaining in the place, so desperate to stop Doomwheel. 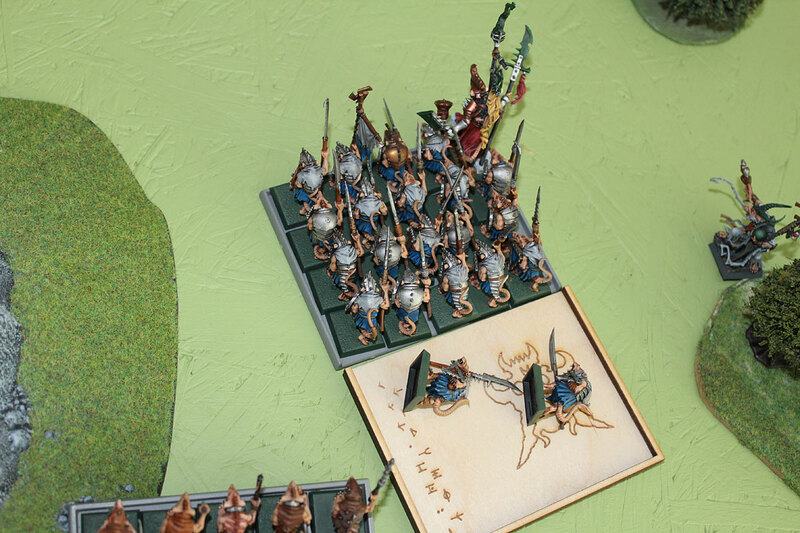 Meanwhile – Glade Guards were stood against Stormvermin. One of the rats in front rank shook off his armour, threw away his halberd. That was no Stormvermin! It was Shide The Silent – Clan Eshin’s Assassin, ready to perform his duty! Captain Antaroth was swift. Shide had to admit that. Probably the fastest opponent he stood against… but Shide was fastest. He dodged the tip of Elven sword, jumped over surprised Glade Captain and cut his throat widely from left to right with his poisonous Weeping Blade. Blood squirted from the open wound and Shide The Silent laughed victoriously. Clan Eshin triumphed again! At the same time Glade guards managed to kill only 2 of Stormvermin. Stormvermin simply proved themselves more superior fighters than Glade Guards. In return they killed 5 Elves. Commander was lying dead, half of the regiment wiped out – that was too much. They fled the combat. 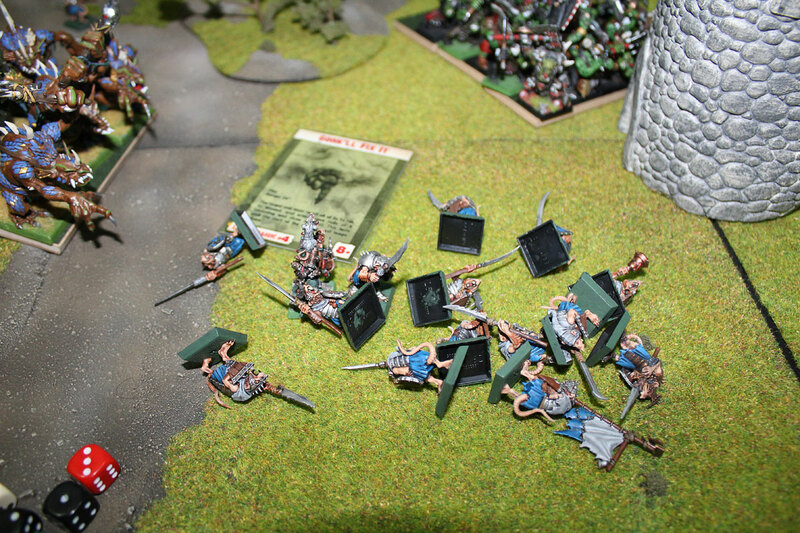 Stormvermin with ease caught remaining Elves and pushed them off the battle – demoralised and broken. Stormvermin are in pursue after fleeing Glade Guard. Lady Alustriel was surprised with such unexpected turn of the battle. Those Stormvermin and this hidden Assassin took out Captain Antaroth’s Guard so easily. The victory was getting away. But she will never give up – she will kill as many Skaven as possible. She will protect the forest to her last breath! Lady Alustriel and her remaining Glade Guards turn to the Stormvermin and shot all of their arrows. All arrows failed to even slightly wound Skaven foe. 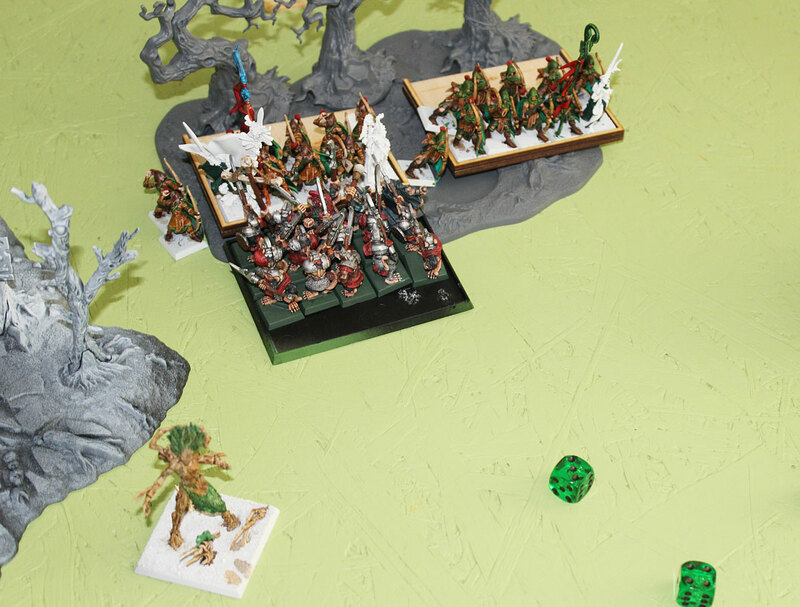 Treemen had more luck – he released his Strangleroots with anger killing three Stormvermin. Three Stormvermin down. Took out by Treemen’s strangleroots. At this moment, Lord Quickskueek was super proud of himself, his tactical and magical skills and already was counting the profit he will gain when he deliver the wood to Putrid Stump. He was sure, the victory cannot slip off his hands! He just could not resist – he laughed at loud! 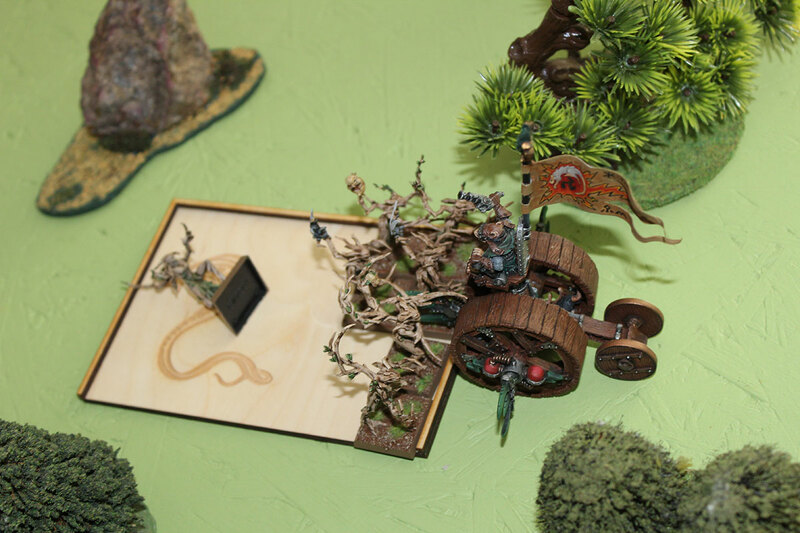 First of all – he ordered Doomwheel to charge into the Glade Guards and Lady Alustriel that was pretty predictable action. Doomwheel was about to crush the reaming Guards! 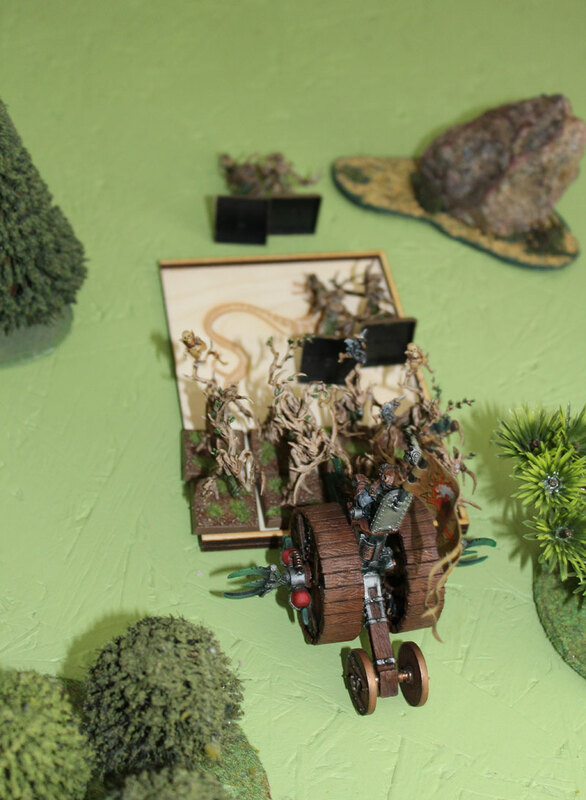 Meanwhile Clanrats advanced forward, making the buffer zone between Treeman and Lord Quicksqueek. Stormvermin turn around – also preparing themselves for potential attack of Treeman. Unfortunately Winds of Magic were too weak – and Quicksqueek was no able to cast even one spell, but Grey Seer’s mood couldn’t be disturbed at the moment. Doomwheel’s charge was destructive. All Glade Guards got shamed under the wheel! Warlock Engineer laughed!…but.. what’s this? Lady Alustriel jumped daintily over the Doomwheel’s controller, and throw small knife into one of the cogwheels blocking it completely. 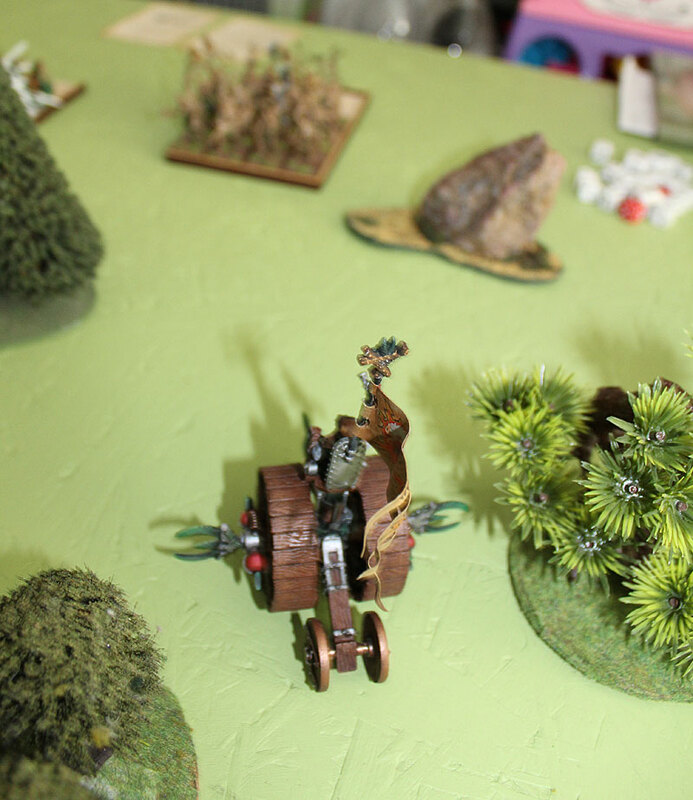 Doomwheel was pretty damaged after the combat with Dryads, and this minor cogwheel blockade was sufficient to overcharge wheel mechanism and blowout the whole machine! The blast was loud and bright! Lady Alustriel managed to jump away and hide behind the rock. She didn’t plan to withdraw. She will fight to the death! Lady Alustriel walked around Doomwheel’s wreckage and she faced Stormvermin unit. Treeman did the same. The plan was to shoot as many Stormvermin as possible. They might fight well, but their morale is low and they tend to panic when they see their fellows are dying 9like all Skaven). Treeman released Strangleroots – 4 Stormvermin died horrible death. The plan was working! Stormvermin unit suddenly turn demobilised and start to flee the battle! The were threat no more! All of the regiments remained at their places. 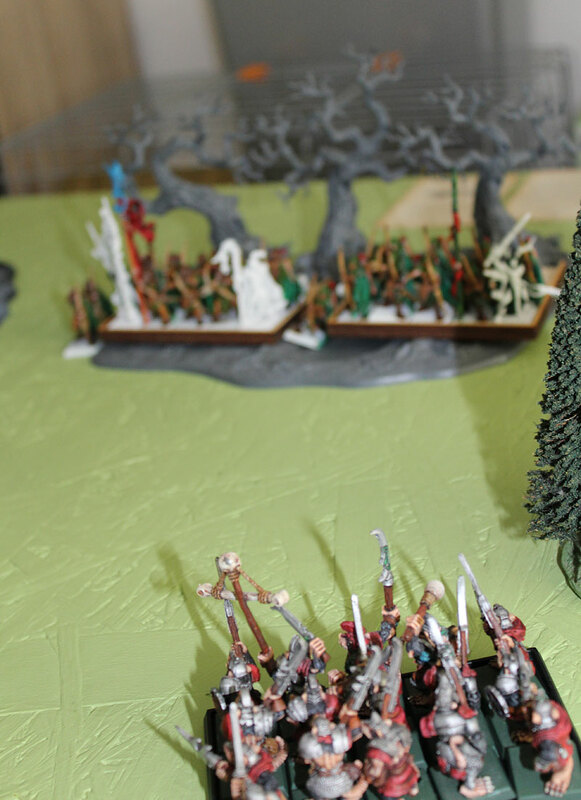 The time was on Skaven’s side – the sun was low, and when the night will come – Lady Alustriel and Treeman will be forced to retreat, and precious Loren’s wood will be Quicksqueek’s. The magical energy in the air was massive! Grey Seer took all the power, gathered all energy in his staff. And start saying the words of Dreaded Thirteenth Spell. He concentrated his will on lady Alustriel – and spoke slowly the invocation. He looked at her blurry silhouette in the distance and imagined how she could gradually transform into something else. Something better. Something superior. …and when he ended the spell – there was no Lady Alustirel at the horizon. There was one lonely scared Skaven. The spell was complete. Elven Lady turned into the ratman! Lady Alustriel transformed into Skaven! Glory to Quickskueek! Blessed be Horned Rat! Victory is mine! She advanced towards Clanrats and shot strangleroots. 2 Skaven warriors got killed. Lord Quicksqueek suspected what Treeman was trying to achieve here. It was slight chance Treeman will succeed, so grey Seer needed to take action to minimize loses. Two Clanrats killed by Death Frenzy. All was left was to retreat deep into the forest and call for help. also sending Assassin against Always Strike first Elves was good strategy. He easily killed Elven Battle Standard Bearer. Points well spent:). Every next battle – I operate Doomwheels with more efficiency. I can imagine I can do this even better. But still.. Doomwheels are fun! This was one of the last WHFB 8th edition battle reports on my blog before my departure to Australia and Asia in October. I have one more battle planned against Goblins and that’s it – hopefully I will get opportunity to play Warhammer Fantasy somewhere on the road. We will see. In the next two moths I plan to concentrate my painting and gaming efforts on Malifaux and Infinty. I’m motivated to learn basics soon. 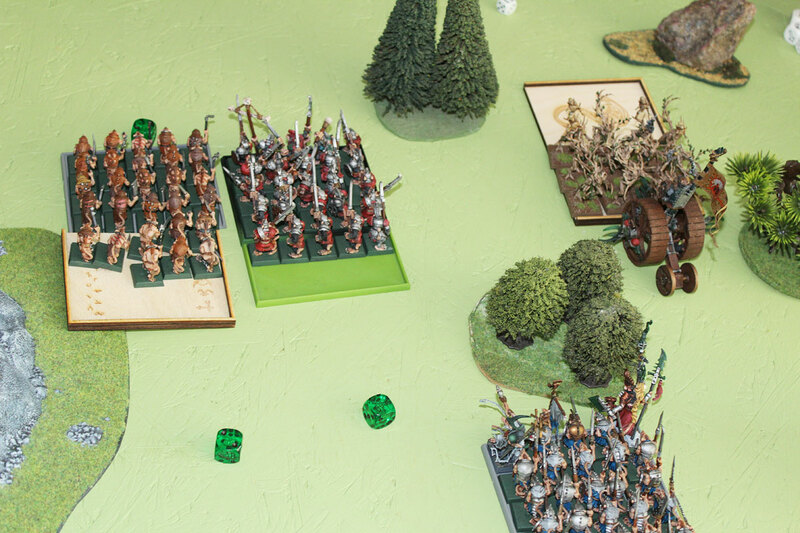 Beside that – There will be some Warhammer Fantasy action on Game of travel. Fear not. It will be Warhammer FB5th edition (herohammer) though – three more battles arranged for September. One more thing to be told. We had all day with Jasiek to play- so right after this Warhammer Fantasy 8th edition battle, we decided to give a try to…Age of Sigmar. 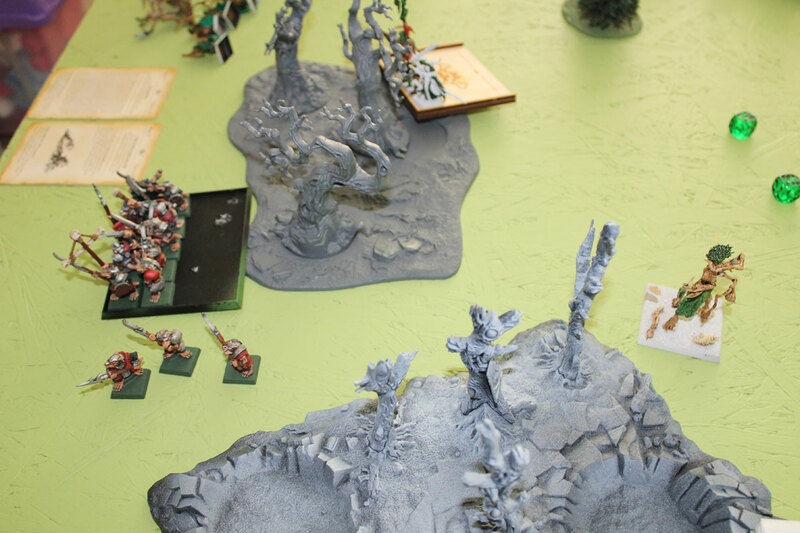 We used the same armies as we played in 8th edition, but with the rules of AoS. My initial impressions and Battle Report soon on the blog. Meantime, I’m back to painting Malifaux and Infinity. Until next time! Good to see the mighty doom wheel on the table!